Home » Culture » The Single Largest Tax on Poor Families: the Lottery? The Single Largest Tax on Poor Families: the Lottery? Last month the Atlantic highlighted one of the most shocking stats I had ever seen. 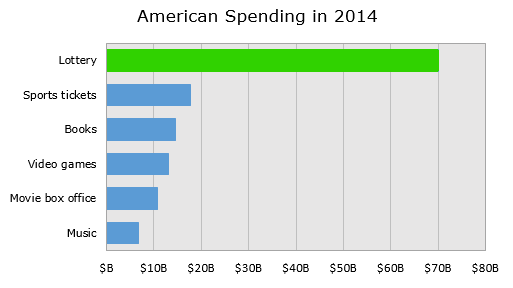 In 2014, Americans spent $70.1 billion on the lottery. that is over $230 for every man, woman, and child in the U.S. It is also more than the combined amount Americans spend on sports tickets, books, video games, movies, and music. Mouse over the map below to see where each state ranks in lotto sale per household. The Atlantic also points to several studies suggesting that this $70.1 spend comes disproportionately from the poor. That got me to thinking. The lottery is a source of state government funding, much like taxes. Viewing it as a tax, how does the lottery compare to other taxes paid by low income households? According to the Bureau of Labor Statistics and the Institute on Taxation & Economic Policy, here are what different income groups pay in various taxes, as a percentage of before-tax income. 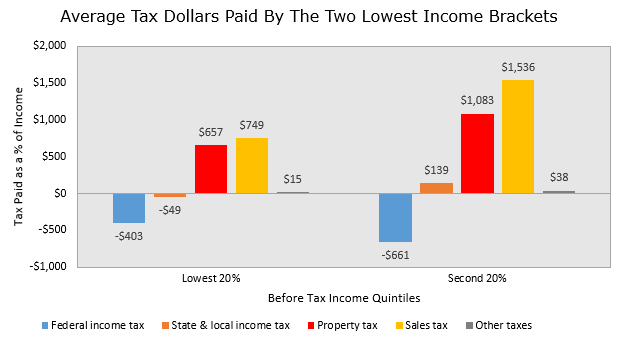 Property and sales taxes are regressive and are the largest taxes paid by the low income groups. 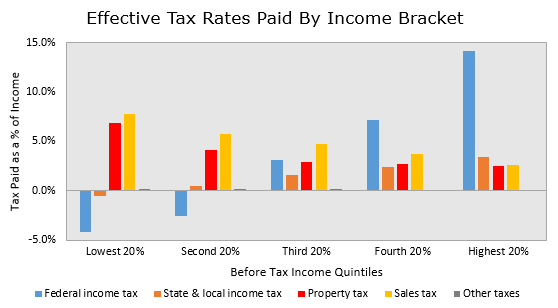 Income tax rates at the low end are negative. That is because the amount received via tax credits often exceeds tax liabilities. For the two lowest income groups, here are these same figures in terms of the actual amount paid. Numerous studies conducted in a wide range of jurisdictions show that frequent or “heavy” lottery players closely resemble the overall population of that state or province. The NASPL website lists several studies and surveys supporting this opinion. 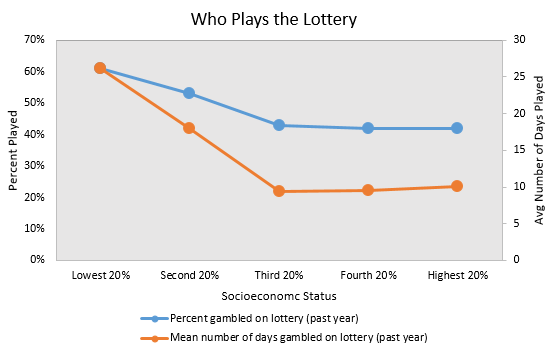 However, there are several other studies that conclude the lottery is indeed disproportionately played by the poor. I am not an expert on the matter, and there seems to be wide disagreement here anyway. So I cannot estimate these figures with any sort of realistic accuracy. But just for fun, lets take one study, make a few assumptions, and see what comes out. Taking this socioeconomic status as a substitute for income (not exact, but not completely off the mark), and assuming the amount spent on the lottery is proportional to the number of days played, here is how the numbers come out. Based on these assumptions, the “lottery tax” is the single biggest tax paid by low income households. Even if you take the conservative assumption that lotto sales are equal across income groups, that still comes out to $566 spent on the lottery per household. In other words, you only have to assume low-income households spend slightly (32%) more than the average, and the lotto becomes bigger than any single tax they pay. I find your tax-on-the-poor argument misinformed and condescending. Some folks escape their everyday lives in a movie theater seat. Others do so while spending $2 to scratch off a lottery ticket dreaming of what they might do if they win. Both provide a form of escapism entertainment. Nothing wrong with that. One man’s gratuitous expenditure is another man’s night at the opera. Lotto is a form a gambling. Have you ever met a family that has had to cope with gambling addiction? I have, and they do not view it anything like a trip to the movie theater. Most addictions are harmful. We all have or can find anecdotal evidence to support this claim. But your “I-know-a-guy” argument doesn’t change the fact that more than 51% of U.S. households play the state lottery at least once in a given year and 99% of those players do not suffer from addiction. My point was simply who are you (or the author of the article) to tell me or anyone whom you contemptuously call poor how to spend our money? I don’t challenge your dubious spending on MacMansions, $200 bottles of wine, or collateralized debt obligations. Given that your email domain is a lottery website and your income likely comes from selling lotto tickets, your opinion is not exactly unbiased. But you said it. Addictions are harmful. Show me someone with a life devastating Kardashians addiction and I will take your argument seriously. The lottery is not a tax. It’s a willingly submitted donation. It is a tax, albeit a voluntary one, the same as alcohol, tobacco, and even sales taxes. 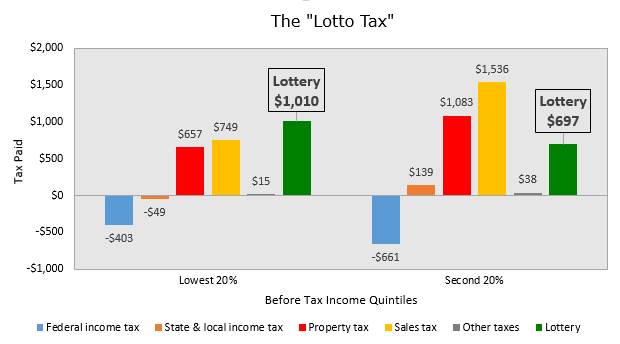 The tax comparison is misleading in that a lottery ticket does have an expected return of $.60 or so, so you should reduce the “tax” amounts. I personally wish we would destroy all the state lotteries, but the value of the entertainment is a real thing for the people who play it. Unfortunate but real. In most cases, I don’t think it’s the government’s business how people spend their money. But gambling is something people do impulsively, so in my opinion not the same as other forms of entertainment. I also don’t feel great about the government encouraging it with commercials, as a way to get rich. Some of it comes back in winnings, but the few people who get rich with the big prizes don’t offset the many people who lost their money buying tickets. There is also the tax on the winnings, the fact that many prizes don’t get claimed, etc. None of it materially changes the result, which is back of the envelope anyway. I wish they would abolish the Broadway show Cats, Keeping Up with the Kardashians, and Chardonnay. Unfortunate but real. Tell that to the people I see whenever I go inside the convenience or grocery store, gas station, etc, who are handing in their fistful of a variety if lottery game tickets from last week, collecting the buck or 2 from scratch offs, handing over $20.00 more in hopes that next week might bring in a $50, $100 win, while they regularly kick in $80-100/mo or more to feed their dreams of next time. Have yet to see anybody yell that they won big. I look at the lottery as a voluntary state income tax, with a chance of a return. My concern is more of what lottery money is used for over who plays it. Interesting analysis, though. – Even if people are responsible for their own choices, I think it is irresponsible for the government to encourage gambling, knowing that people do it impulsively against their own interests. I would say the same if the government had commercials encouraging people to smoke. – If they are going to make the case that people have a choice, why not open it up to the free markets? The government has laws against anti-competitive business practices when they happen in the private sector. Why should it be ok for the government to operate a monopoly? If they let private business operate lotteries, the payout rates would be much better. As it stands, the government is basically running a price gouging operation. Those are just personal views though. Don’t think there is a right answer here. how on earth can someone smart enough to have done the incredible map of property values say that a voluntary payment like the lottery is tax ? Who are you to tell other people how to spend their money ? Who appointed you god , to tell other people how to live their lives ? We live in a free market society and people should be able to spend their money how they want. No argument there. But free markets only work if they are free on both sides. And at the moment, the government has a monopoly over the lottery. And it is extorting monopolistic profits. The result is exactly the same as a sales tax. To make things worse, problem gambling is medically recognized as a addictive disorder. And the government should not be promoting it with misleading ads. If the government were releasing ads encouraging people to smoke, I would not be in favor of that either. Don’t you ever pay the voluntary sales tax? Where’s the payroll (Social Security + Medicare) tax? I made the calculation (came out to about $600 for SS and $150 for medicare for the bottom group), but ultimately did not include them, and don’t remember why. Need to go back over my notes and add an explanation to the post. Mr. Galka, would it make sense to use the economic profile of lottery winners as a proxy for the economic profile of lottery players? Not all winners would be captured, since I’m sure there is no recording of small winnings. But larger winnings are tax events; Powerball-like winnings are news events. And if the likelihood of winning is based on frequency of playing, then the pre-winning economic profile of winners might be a reasonable profile for the economic profile of players as a whole. I teach economics ata community college, and regularly explain how profoundly evil the state lottery is. I characterize as a tax on the financially ignorant. It’s a good suggestion. I have a list of all winners in CA during one year via Freedom of Information, and it’s a large sample. It would be easy to guess an economic profile based on where they live. Though I’m not sure if there is a way to get the economic profile of the people themselves. 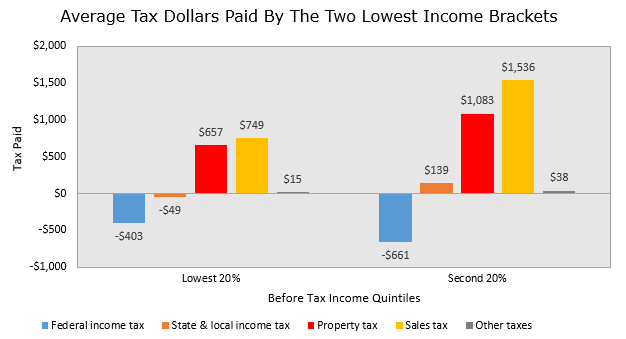 Good article, and I agree overall, the state run lotteries are shown to NOT INCREACE SCHOOL FUNDING, and are a regressive tax.However I must correct you about sales, and property taxes, they are proportional, not regressive.